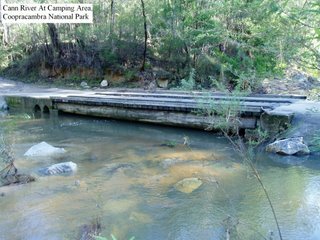 29th July 2006 – Coopracambra National Park, 29k North of Cann River, East Gippsland, Victoria and 59k South of Bombala NSW. 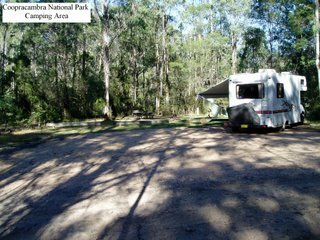 A small camping area is situated about 100m off the road, is suitable for only one or two campers next to the Cann River surrounded by tall gum trees, with a fireplace and two tables provided. 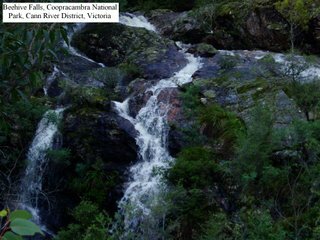 A walk to the Beehive Falls is about 2.5k each way along a well-made track. Unfortunately, low branches prevented us from driving any further into the park. 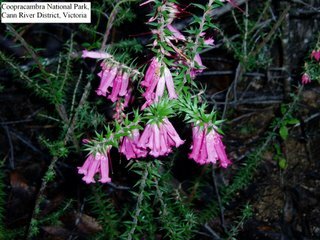 Although close to the Monaro Highway, it was very quiet during the night, as traffic was minimal. A good place to camp and recommended if small enough and travelling this way. Allow room for a coaster school bus to turn during the school term.